Would you make a good surgical assistant? Take our career test to find out how you match with this and over 800 other careers. What is the workplace of a Surgical Assistant like? A surgical assistant is a medical professional who aids the surgeon and nurse during operations and other medical procedures. They also have specific responsibilities both prior to and following the surgery. Some of these duties include assembling and monitoring any of the tools that are to be used during the surgery. They also ensure that all necessary paperwork has been appropriately completed and filed, and that the operation room is clean and ready for use. As a result of their work, the operation process is made simpler, faster and with a higher chance of success. This is an ideal career for those who are intrigued by the surgical process, yet who are overwhelmed by the pressure of performing an actual operation. A surgical assistant is given several duties prior to the surgery, during the procedure, and following the operation. 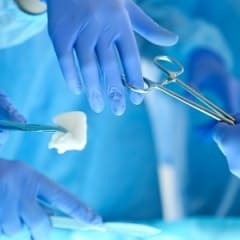 Pre-surgery tasks largely involve the cleaning and sterilization of any medical devices or tools. They make sure that these tools are also in proper working order. Additionally, they are responsible for the preparation of the patients. This means that they interview the patients prior to surgery to learn about their health history and any previous medical conditions. They also set up any charts, x-rays or patient documentation required at the nearby operation site. During the procedure, the surgical assistant is a direct aid to the surgeon. They perform all of the most basic surgical duties, allowing the surgeon to focus on the highly technical procedures. Common responsibilities are to monitor the electronic equipment and to make sure that a patient's vital signs are responding normally. They perform smaller medical procedures such as inserting tubes, administering needles, closing wounds and cutting sutures. They sometimes take on larger roles such as resuscitating patients who have stopped breathing. Furthermore, they must always be attentive, providing the surgeon with any tools or instruments that they currently need. After a surgery has been successfully completed, it is their role to clean and restock the operating room for another use. An effective surgical assistant must have a wide range of personal and professional skills. Foremost, surgical assistants require strong hand-eye coordination and dexterity. This is because the work involves performing small surgical procedures. They must also be capable of handling high-pressure situations. Operations are tense, and they must be able to react instinctively in a short time frame. A certain level of personal fitness is also needed to lift and reposition patients. Furthermore, they should have a high attention to detail and a long attention-span to spot anything that is abnormal in a patient's vital signs. A strong adherence to personal hygiene is also needed, as cleanliness is an important safety consideration in the medical field. Surgical assistants have to be adept at working both independently and in a team environment. Pre-surgery and post-surgery procedures are usually done alone and require both self-confidence, motivation and research skills. Operating procedures are done in small groups including nurses and surgeons. As a result, surgical assistants must have effective communication skills, a positive attitude and an ability to correctly respond to orders. Are you suited to be a surgical assistant? Surgical assistants have distinct personalities. They tend to be conventional individuals, which means they’re conscientious and conservative. They are logical, efficient, orderly, and organized. Some of them are also social, meaning they’re kind, generous, cooperative, patient, caring, helpful, empathetic, tactful, and friendly. Does this sound like you? Take our free career test to find out if becoming a surgical assistant is right for you. The majority of surgical assistants will work in a hospital setting where numerous surgical procedures occur on a daily basis. They will spend most of the day on their feet and in the operating room. This is a full-time job, and they typically work for 40 hours a week. Shifts can be long depending on the number of patients that are scheduled on a given day. Additionally, weekend and holiday work is also a frequent occurrence.